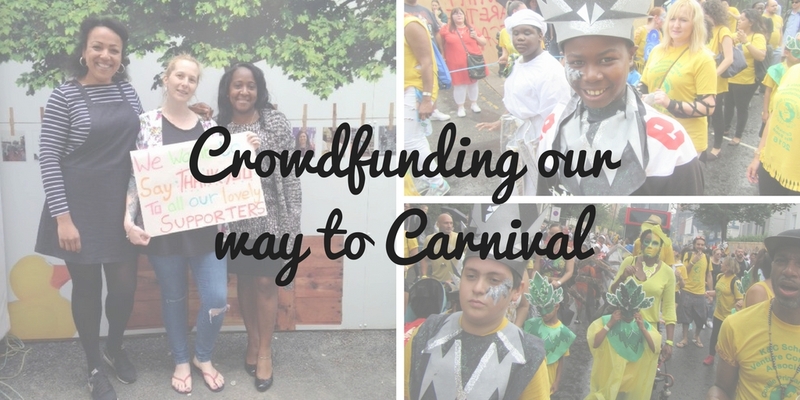 Naami Padi, the Director of Venture Community Association, shares her experience of crowdfunding for the Venture Kids to participate in Notting Hill Carnival. The answer came in March when I got a phone call from Therese, a wonderful friend of Venture and Thomas’s School Foundation representative. Therese instructed me (as she often does when there’s a blink and you’ll miss it opportunity) to sign up to the ‘Summer Give’ as a way to raise money for the camp before 5pm the following day. I had no idea what this was but, as she’s never let me down before, I dutifully obliged. It was only later, upon reading the small print that I started to sweat realising it was a crowdfunding campaign (albeit with match funding). I decided to park my anxiety as the campaign window wasn’t until May and get on with my work. This was my first mistake, lack of preparation! The second phone call came from Ollie, an extremely helpful community engagement officer from the council. Ollie asked me if I’d consider posting a project on their new crowdfunding initiative with Spacehive. After Ollie convincing me that I’d get lots of support and guidance I agreed to post the carnival project. Again I supressed the desire to say ‘I have no idea what this is all about and am petrified that I will let the children down’ and decided to go home and do some research. Once I’d got to grips with the idea that I had to somehow convince individuals and businesses to support these campaigns I started off by writing some very polite, slightly apologetic, emails to people that I thought may like to support us. The response was dismal. I then decided to ask my own friends and family to start us off with a small donation (please, friends, I beg you, give me something, anything!) and several did, out of pity. I felt really deflated as the donations bar barely flinched during the first week. Don’t be afraid to ask for what you want. Make an appointment at a local estate agent, briefly pitch the project and ask for a large contribution. They have the money, you need the money. Say thanks. Once people have donated thank them with a nice simple note (again containing strong imagery) and ask them to get two more people to do the same. Another big change in the campaign came about when one of our trustees, Sheraine, frustrated by the lack of progress, helped me call an emergency meeting of key staff and essentially galvanised the troops. Once our staff understood that this wasn’t something I could do alone they really did take ownership and came up with some very creative campaign ideas. They held a cake sale, disco and shook buckets at a local music festival, Portobello Live. Local organisations also started to support the campaigns with larger donations which pushed up the bar and encouraged more individuals to donate. After six long weeks of meme-making, tweeting and bucket-shaking we finally achieved our targets for both campaigns raising over £5,000 for the carnival project and £8,000 for Summer Camp. I was exhausted but very, very proud. My message to other organisations considering crowdfunding would be to do it, the exposure and goodwill that it generates is worth just as much as the funding itself. One word of caution though- please plan the campaign in advance and whatever you do, don’t run two campaigns at the same time! Special thank go to; City Living Local Life, Love Golborne, Westway Trust, Catalyst Housing, the K&C Foundation, Thomas School Foundation and Estate Create whose large donations helped to generate more local interest and get us over the line. Check out the Venture Kids Carnival project on Spacehive here. Got a great idea for a community crowdfunding project? Upload it to Spacehive and you could be eligible for funding pots from the Westway Trust, the GLL, Growing a Greener Britain, your local council and more. It’s never been easier to transform where you live so get started with Spacehive today!